Anthem Could Well Be 2019’s Fallout 76. Here’s Why. Anthem from Mass Effect and Dragon Age developer BioWare is the studio’s take on shared-world shooters like Warframe and Destiny. There’s a sci-fi setting complete with vast environments to explore, and of course, a focus on cooperative, social gameplay. 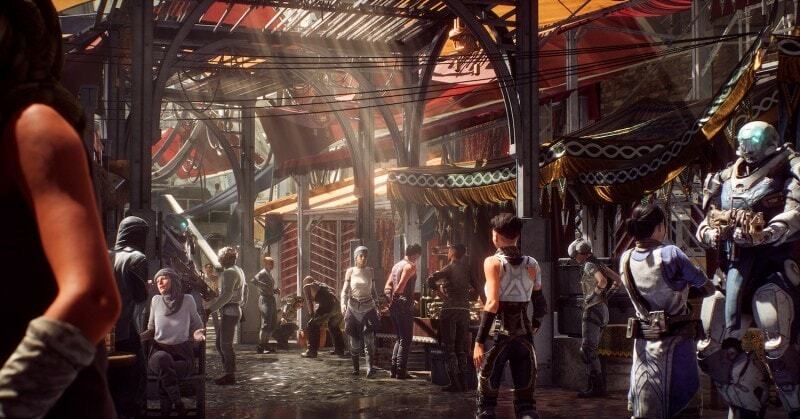 Considering BioWare’s pedigree in single-player, story-driven games, Anthem is an attempt to merge the developer’s strength in narrative with what its parent company EA considers necessary in 2019: an always-online game world replete with micro-transactions. Despite suffering a host of bugs ranging from boss fights not working and entire sections of the game world being inaccessible, we managed to play through most of the Anthem demo on the Xbox One ₹ 39,990 X to bring you what you need to know. Set in a distant future, Anthem puts players in the role of a Freelancer, warriors for hire that pilot exosuits known as Javelins across hostile environments. Javelins are essentially mass-produced variants of Iron Man’s armour available in different types ranging from the speedy Interceptor to the bulky Colossus, each with its own skills and abilities. Javelins can, of course fly, giving you the ability to get around Anthem’s world that’s teeming with enemies aplenty can fly. The only time you’re outside a Javelin is in Fort Tarsis, the game’s hub world. Here you’ll meet a bunch of different characters that you can talk to; while some of them, like Yarrow, would be a part of your support crew giving you information on the game world, others like Matthias would send you out on missions, and a precious few like Lucky Jak would use your opinion to aid them make decisions ranging from what contracts they should take next. And then there’s a one-time TV show extra turned bartender Amal who needs your advice on whether he should give up a potential love interest to the authorities. They’re a varied bunch and talking to them is never boring. It plays up to BioWare’s skill in character interactions and dialogue, something we’ve seen over the years with the Dragon Age and Mass Effect games and makes Anthem’s Fort Tarsis a place we’d like to explore more of. However Fort Tarsis usually bookends Anthem’s many missions and you’ll spend most of your time in a Javelin flying around exotic looking landscapes. 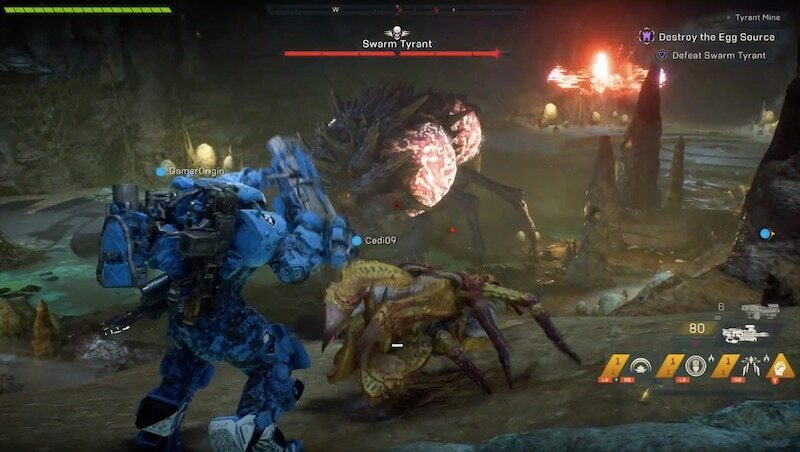 From hunting down a lost researcher (or Arcanist as the game calls them) in murky ruins to unironically taking down giant bugs in caverns, Anthem appears to have a host of great locations and getting around them is easy thanks to each Javelin having the ability to fly. Simply tapping a button and pressing down on the left analogue stick makes flying through Anthem’s world easy. Not only is flight in Anthem intuitive, but it also shows off the game at its best. Some of its best moments are just jetting through the air with rays of light bouncing off your armour with a dense, colourful jungle below. It’s a treat to watch. Aside from flight, there’s little else that’s new with Anthem’s gameplay mechanics. Shooting feels a bit stiff with guns lacking any personality. The act of firing feels very dull. It’s devoid of any feedback or recoil, an odd approach when compared to weapons in other games where they have a lot more character like Destiny 2. Much like that game, Anthem’s javelins have their own special abilities. These include the Colossus’ heavy hitting siege cannon and the Interceptor’s close range flurry of melee attacks. They’re welcome additions to mix up the combat and can do a ton of damage. On their own, each of Anthem’s battle systems like its shooting and Javelin abilities aren’t anything we haven’t seen before. But it ends up being greater than the sum of its parts when combined with flying. It’s a useful way to get the upper hand in combat, allowing you to take down powerful foes from a distance or simply giving you the manoeuvrability to hit an enemy’s weak spot. Other aspects of Anthem don’t fare as well. While the game world is vast, its ever-present blue marker to denote where you should be heading to next destroys any attempt at exploration. What’s the point of creating a gorgeous space to play if we’re forced to tunnel through a pre-determined path at all given times? When you squad up with friends, they also have a similar looking icon. This makes navigating objectives a confusing mess at times and the presence of random loading screens during missions take away from any sense of immersion. Speaking of which, if like us, you tried booting the Anthem demo after a 26GB download, it was disheartening to be met with issues aplenty. Aside from the aforementioned problems regarding progressing through the demo’s content, there are other concerns. These include an infinite load screen that forced us to close the game and open it again to get into missions, and a glitch that prevented us from moving by resetting our movements every few seconds, one step forward was literally pushed one step back. 2019's, 76., Anthem, Be, Could, Fallout, Here's, Well, Why.